Seafood has always been a go-to choice while abstaining from meat during the Lenten season. But this period also presents the perfect opportunity to expand your fish options and introduce vegetarian dishes into your dinner routine. If you still want to eat fish during Lent, think beyond the basic flaky white fillet. There is a whole ocean of interesting possibilities. There are chowders such as creamy New England style, tomato-based Manhattan style, and the clear broth version from Rhode Island. 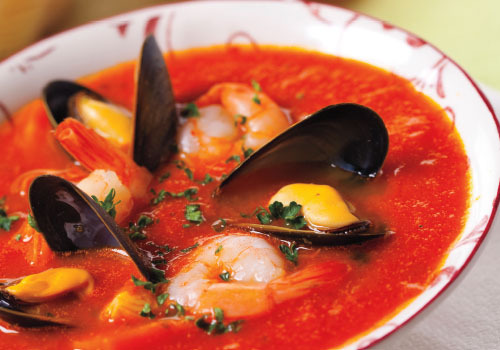 Bouillabaisse is another option usually made with a variety of seafood but gets its distinct flavor from saffron, fennel seeds and orange zest. Cioppino is traditionally made with Dungeness crab, clams, shrimp, scallops, squid and mussels but is very versatile. Its simple tomato and wine based broth can be made with whatever fresh or frozen seafood is available at your local market. Try ancient grains such as faro, quinoa or barley, any of which make a great base for a salad. Add depth by roasting vegetables to pack in plenty of savory flavor. Put some color in the salad by adding fruit such as mangoes and oranges. These protein packed ancient grains can be used to make all of your favorite rice dishes like pilaf risotto or a stir-fry. Using global flavors and ethnic spices opens up many possibilities for you to get creative when meat is not an option. Draw inspiration from Mexican, Indian and Asian recipes. Dumplings are a tasty vegetarian option such as Chinese pot stickers, Japanese gyoza, or Russian pelmeni. Pierogi may be known for simply being pockets full of mashed potatoes and cheese, but the versatile Eastern European favorite lends itself well to a wide range of ingredients and fillings. A traditional vegetarian option is mushrooms and spinach. Middle Eastern cuisine has many vegetarian choices perfect for Lent. Falafel – typically made of chickpea or some other bean – can be used as a sandwich filler, served on its own, or paired with a salad.